Combine the mayonnaise, lime juice, chili paste, red pepper, lime zest, Fish Base and sugar in a large bowl. Add the Napa cabbage and the purple cabbage and toss to coat. Place the coleslaw in the refrigerator until ready to use. Add the oil to a large stockpot and heat to 375°F. Combine the Original Recipe Breading Mix for Fish and the cayenne pepper in a large shallow dish. Pour the eggs into a shallow dish. Dip the cut fish into the eggs and then dredge in the breading mix. Carefully add the breaded fish to the fryer, in batches, and fry for 2-3 minutes or until golden brown. Using a slotted spoon remove the fish from the oil and place onto a plate lined with paper towels. 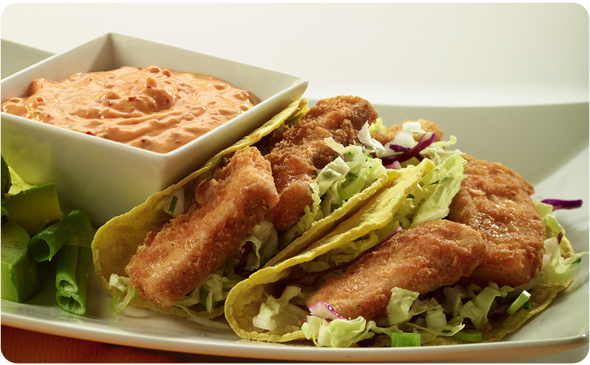 To assemble the tacos place 2-3 pieces of fried fish onto a warm corn tortilla and top with ¼ cup of the coleslaw. Repeat with the remaining fish. Serve immediately.